VirtueForex offers multi account manager account (MAM / PAMM / LAMM) for fund managers and traders. We use trading software for MAM / PAMM / LAMM of Russia’s MetaQuotes company, ordered to trading account (child account) of each client connected to MAM / PAMM / LAMM based on preset algorithm and distribution method Distribution and profit distribution can be done. Since the MAM / PAMM / LAMM account has the same function as the normal MT 4 transaction, there is no transaction restriction etc. In addition to confirming open orders and closed orders in real time, if you wish to set up a performance fee from investment income, it becomes a sophisticated software that can be calculated automatically from the MAM / PAMM / LAMM platform We will. MAM is an investment method that investors entrust funds to their FX account and entrust their trades to account managers (operators). Investors can view open orders and transaction history in their account in real time. Investor’s accounts are allocated gains / losses as a result of transactions by account managers (operators) according to the margin ratio. As with MAM, PAMM is an investment method that investors entrust funds to their FX account and entrust their trades to account managers (operators). The point that is decisively different from MAM is that investors can only know the change in managed assets and can not see open orders and transaction history. Gains and losses resulting from the transaction by the account manager (operator) are distributed according to the margin ratio. Virtue Forex LAMM is an investment method that investors entrust funds to their FX account and entrust their trades to account managers (operators). 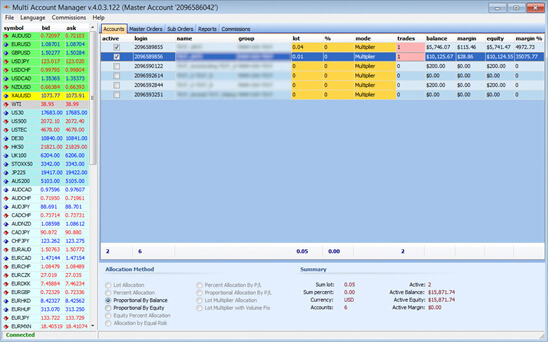 The client can confirm the actual transactions of the account manager (operator) in real time in his / her account. The crucial difference between Virtue Forex LAMM and MAM and PAMM is that LAMM is a copy trading system. What does that mean? The trade (trading) done by the account manager (manager), the parent account, is copied and executed in proportion to the margin (child account) deposited by each client . VirtueForexLAMM has two major features that have never existed before. ① In the case of the copy trading system existing in the world, there is no guarantee that the contract price at the account of all clients (child account) matches the contract price of the account manager (operator), so the number is PIPS shift. However, in Virtue Forex LAMM, the contract price in the account of all clients always matches the contract price of the account manager (operator). This is a unique system of Virtue Forex LAMM. Furthermore, ② The biggest merit of Virtue Forex LAMM is that it allows customers to settle themselves even in the presence of positions. For example, in case of MAM or PAMM, if another client B desires to continue operation even if client A wishes to withdraw money, the account manager (operator) can not meet the needs of both You must do a trade according to one or the other. As a result, it often resulted in complaints from clients. However, in the case of Virtue Forex LAMM, Client A can freely adjust its position because it can settle at any time in his account, and can withdraw money. Account managers (operators) can also keep trading without concern about client A. Since Virtue Forex LAMM is also managed by margin management in individual accounts, it can be said that the two are the strongest win-win systems for both, as long as the client margin is insufficient to buy and sell. Requirements for establishing MAM/PAMM/LAMM account of VirtueForex are as follows. Customers who wish to use the MAM/PAMM/LAMM account, please contact our customer support.